For casino aficionados, a trip to Monte Carlo should be one of life’s highlights; the luxury surroundings, the sunshine and the harbour setting make it something to tick off your bucket list. If you can’t make it though, why not try out a classic slot which has at least includes Monte Carlo in the name. 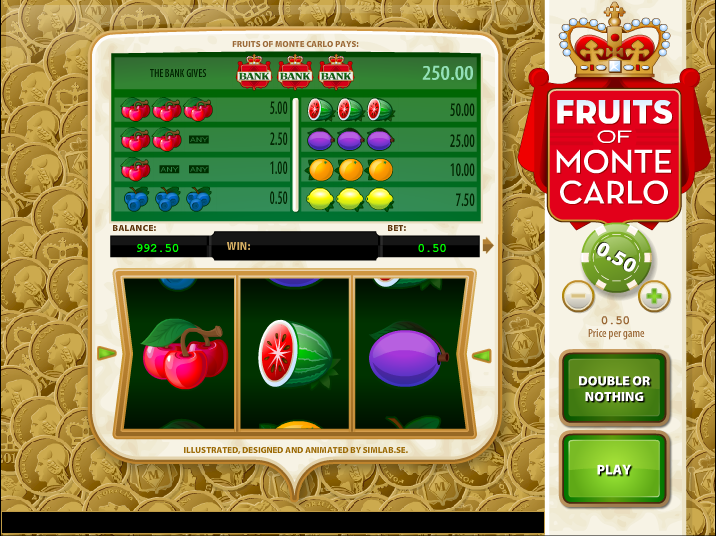 Fruits of Monte Carlo is a brand new three reel slot from WMS Gaming with a roulette-themed bonus game. This is a real back-to-basics slot and it should appeal to anyone who appreciates the traditional spin and win genre. The background to the reels is full of gold coins and each time you win a few will dislodge and drop to the bottom in a very satisfying manner. The symbols will be familiar to all slots fans and include lemons, oranges, plums, melons, blueberries, cherries and a Bank logo. 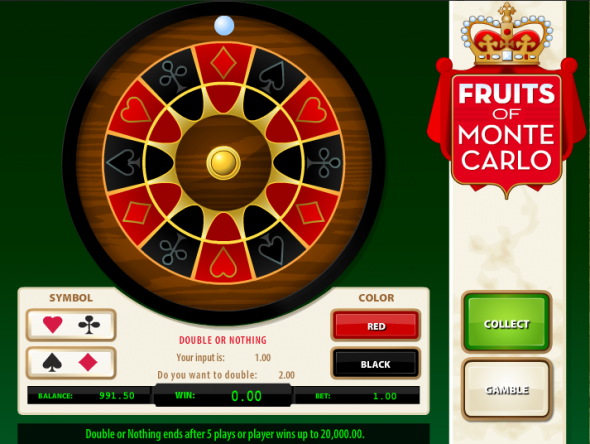 A cherry on the first reel, or first and second reels, will guarantee you a win and all other wins are triggered by three symbols on the only payline. The jackpot is won by landing three of the Bank symbols for 500x your stake. You can win up t0 five times in a row or a maximum of 20,000 before the round ends; if you lose you’ll be sent back to the reels with nothing. You’ll win quite regularly, especially with cherries on reel one and that means lots of chances to have a pop at the roulette feature. Each time you win a roulette spin, the odds for the next spin decrease dramatically so don’t just keep gambling regardless; grab one or two wins then collect your prize. This is a crisp and clean slot with a nice bonus feature and some classical music to accompany you on your gaming journey; you might not be sipping an espresso on the waterfront but a few big wins can help you on your way.